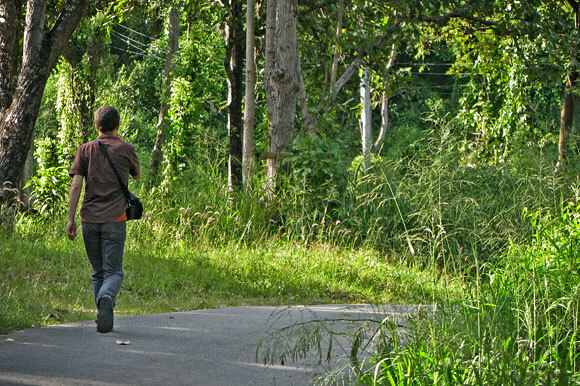 In the past few days, there have been many new people in J. and I’s sheltered Thai life. 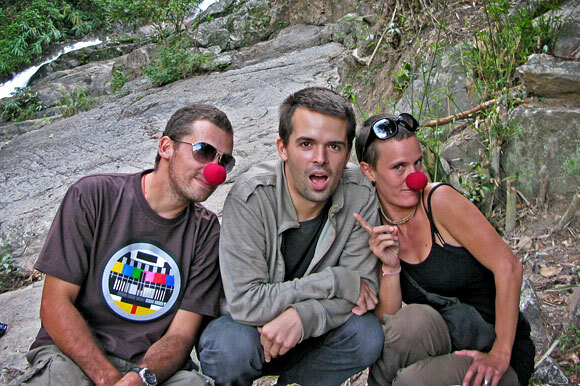 In order of no importance: an adventurous Swiss couple, two Americans girls who share the same first name, and an old Thai friend who came back from studying in the States. If only these people had been around earlier to help balance out our reclusive life. At least I know that J. and I can spend every waking moment together, often in the same small room, and not rip each other’s heads off. It has been a good, bloodless test. On Sunday, we met four people at the walking street market and walked around, snacked, and talked. 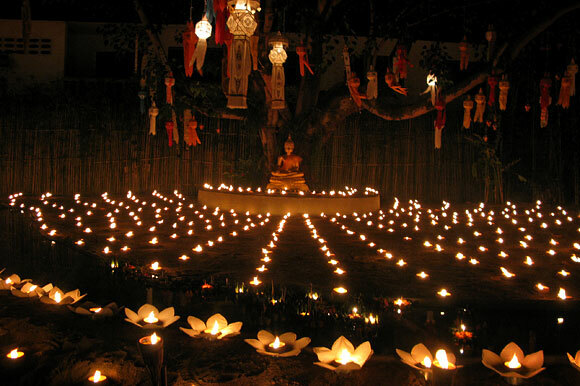 One of the temples had the last remains of The Loy Krathong Festival. Along one fence were numerous, evenly spaced candles. 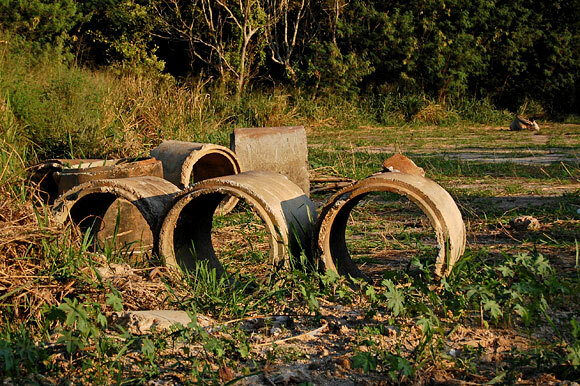 It was outer space on the ground. Me and the Swiss couple at the waterfall. They were only in town for a short time before continuing their epic budget trip around the world. The next day we went to the reservoir for lunch. These two were much more adventurous than J. and I; they hitch-hiked in Mongolia, stayed in Indian backwaters, slept in tents in the middle of nowhere. Inspiring and terrifying. Me, strutting through the woods. 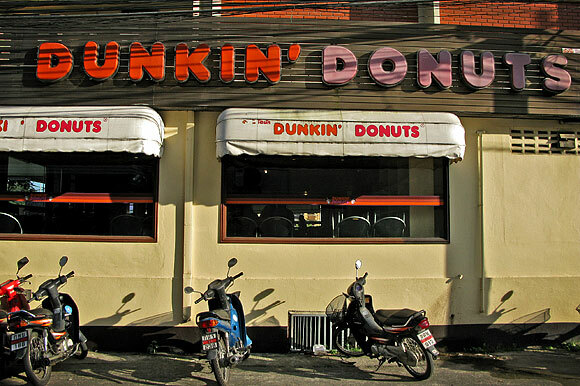 We got a donut and coffee at an enormous old Dunkin’ Donuts on Huay Kaew and the Canal Road. It’s an air-conditioned teen hangout. 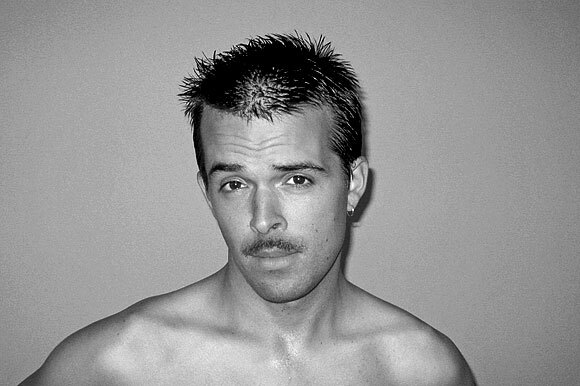 Testing out a new mustache. I would have fit in in India. Thailand: not so much. 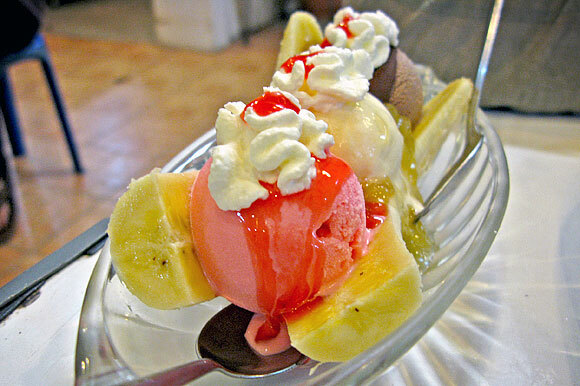 Banana split for $1.25 at good old Milk Zone on Huay Kaew. 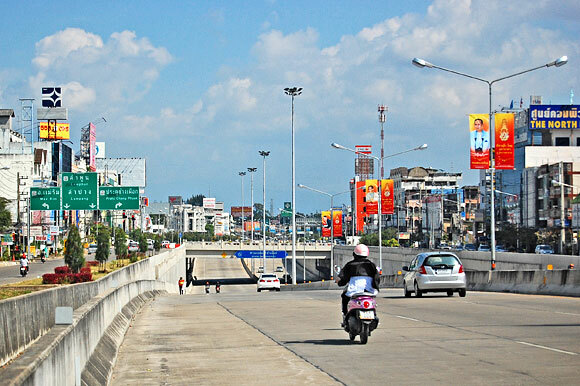 Yesterday, we drove to the train station to book tickets to Bangkok for Saturday. They were sold out of every seat on every train. Dang tourist season. On the way home, we drove by what I hoped was a Willy Wonka style tuk tuk factory, but it looked more like a service station and there weren’t even any tuk tuks to be seen. The Nancy Chandler Map has once again created a misleading impression of awesomeness. We booked bus tickets instead. I wasn’t in a driving mood, but J. convinced me to go to a umbrella village called Bo Sang about 10km outside of town. I begrudgingly obliged, considering she had been wanting to check it out for some time and we were on the right side of town. The drive was pleasant. 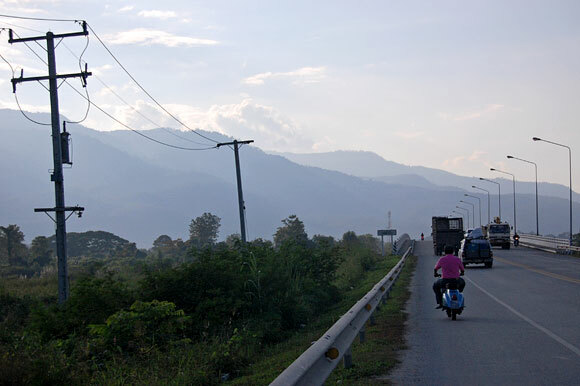 The road leading to Bo Sang was lined with large fragrant trees growing out of the pavement. The “village” was basically a small town like any other, but with more handicrafts. While J. looked around, I got some papaya salad, water, and a bean bun and hid in the shade out of view of the pale tourists arriving by colorful busses. There were life size cutouts of Thai women holding umbrellas. The ladies were missing faces. I saw many people sticking their own faces through the holes and getting pictures taken. They seemed overjoyed to pretend to be a 2-d umbrella-holding Thai woman. I wonder what Freud would think. 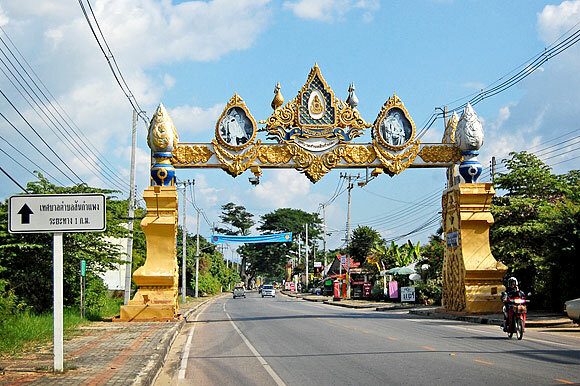 The closest Chiang Mai comes to a highway. This road is called the Superhighway, and it loops around half the town. 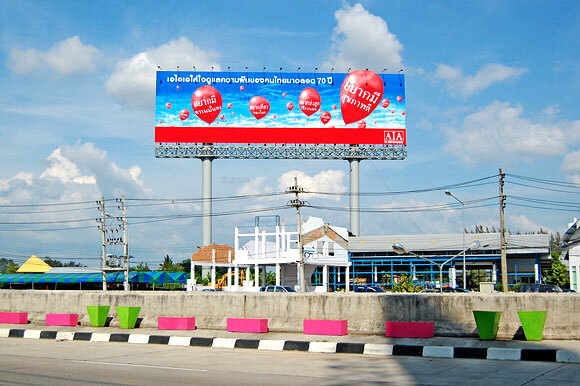 Huge billboard, colorful empty planters. 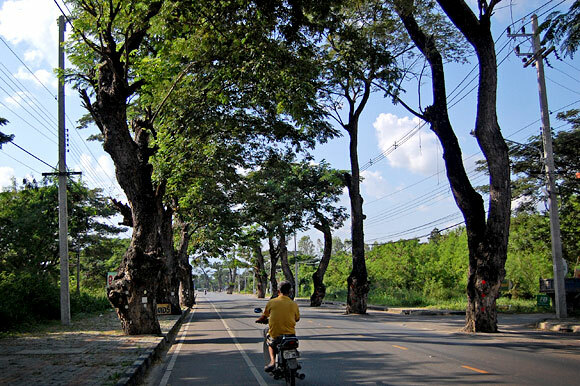 Tree-lined road to Bo Sang. 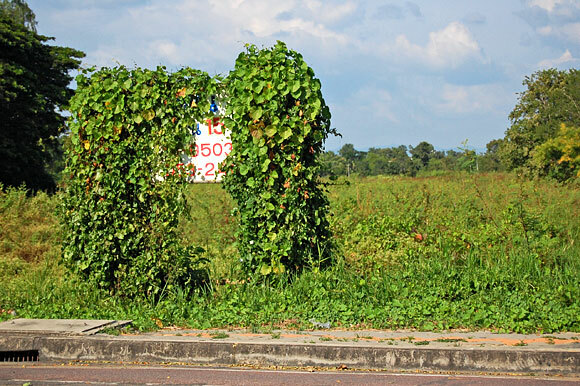 The ivy doesn’t want the lot to be sold. Unsecured gazebo getting transported by trailer. 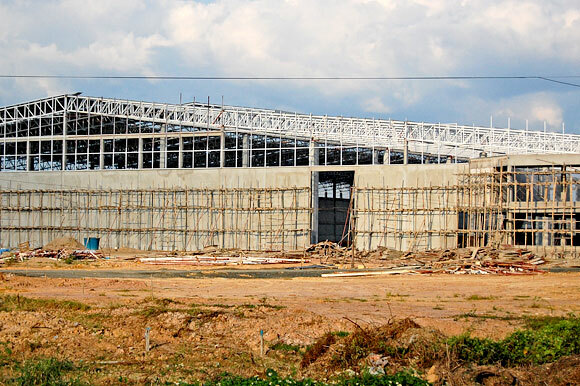 Enormous warehouse getting build along the road home. A gradual bridge over the Ping River. 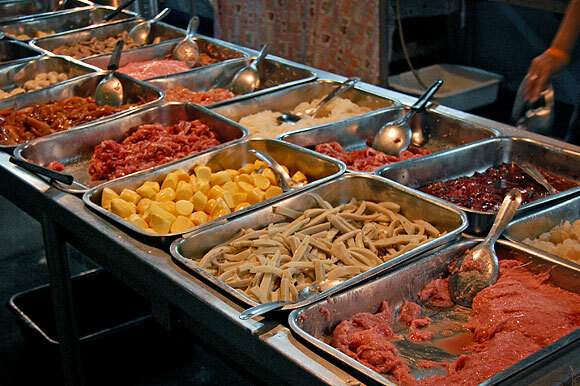 For dinner, we met my Thai friend at an enormous open air hot pot buffet near our apartment. This place had seating for hundreds and food to match. In the background was karaoke and WWF wrestling. 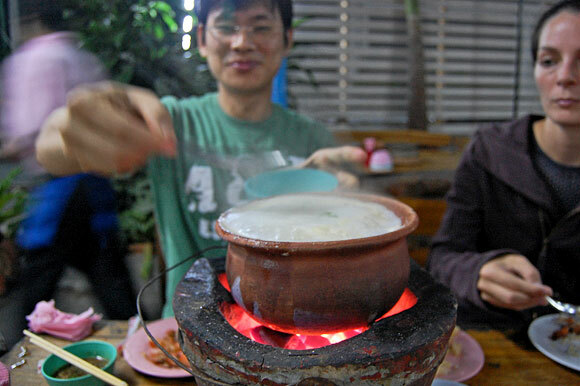 For 130Bht($4) a person, each table got a clay pot of broth boiling over wood coals and a grill over another batch of coals. There were endless tables of any kind of meat you can imagine: beef, pork, chicken, mussels, prawns, guts, fish, fish balls and slabs, etc. We piled as much as we wanted onto metal trays and brought them back to the table for boiling and grilling (though there is a large grilling station too). To the broth, my friend added all sorts of greens, two eggs, and the meat. The broth was a delicious combination of chicken stock and lemon grass. On the side, we had hearty portions of fried rice, fried chicken, and papaya salad. 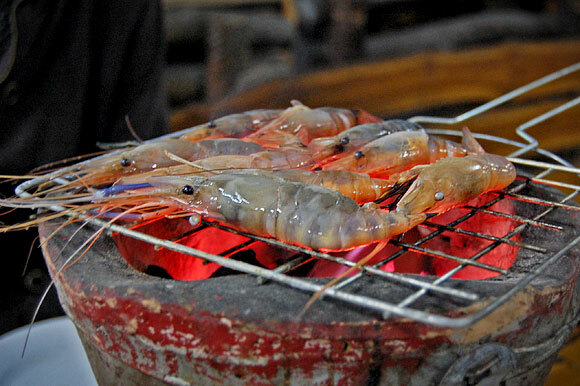 I grilled 8 HUGE prawns (many of which had eggs on their bellies) and some chicken. For desert, they had platters of tropical fruit, ice cream, and a shaved ice machine with all sorts of exotic Thai toppings. Wonderful. W. dishes out the first batch of soup as J. looks on stoically. 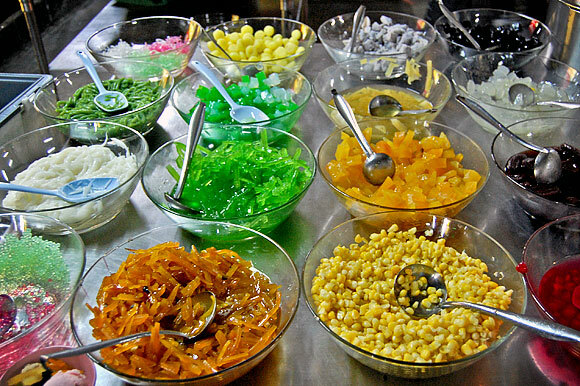 The numerous topping for iced cream or shaved ice. My two favorite toppings were grass jelly (the smokey black jelly on the top right corner) and candied pumpkin (lower left). It was fun to eat a large meal we made ourselves. Most of our Thai meals have been short affairs; this was drawn out and relaxed. 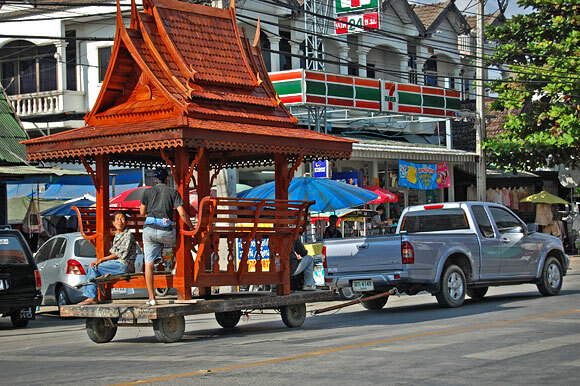 My friend obviously misses living in Thailand. I think it’s mostly because of the food.